The third and final test in the drop cutter algorithm is to drop the cutter down so it touches an edge. The vertex and facet tests were quite easy, but this one requires a bit of calculations. I'm following Chuang2002. To simplify things we first translate the tool in the (x, y) plane to (0, 0), and then rotate the edge we are testing against so that it lies along the x-axis and is below the cutter (or on top of the x-axis). 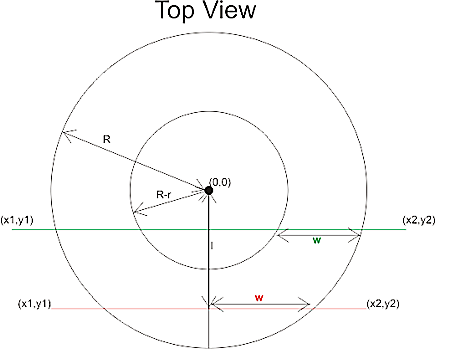 The distance from the edge to (0, 0) is l.
Now we imagine a vertical plane through the edge and slice the cutter with that plane. 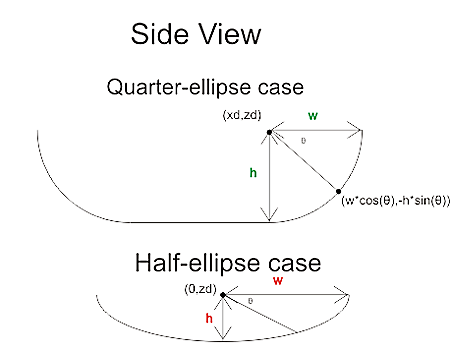 There are two cases, depending on l.
the intersection of the cutter will be a half ellipse centered at xd=0. Now I need to put all these tests together and find a way of importing STL files into matlab. That way I can begin to test if/how my drop cutter algorithm works! That's an interesting comment, do you have a link to a paper or site which discusses this? some code that solves the problem? a picture? I will be working with cylindrical and spherical cutters at first but it would be nice to have the harder toroidal cutter working also! I took a look at the papers. Chuang 2002 clearly talks about ellipses and that's where I took the material for this blog post. That's all wrong, and Yau 2004 seems to have it right. Apparently the contact point with the cassini oval can't be computed exactly in closed form, so they use a Newton-Rhapson iterative root finding algorithm. but isn't it h=sqrt( r^2 -(l-(R-r))^2 ) ? Pingback: anderswallin.net › Drop cutter might work!